Total colony control. Targeted ant bait for professional pest management on a broad range of ant species. 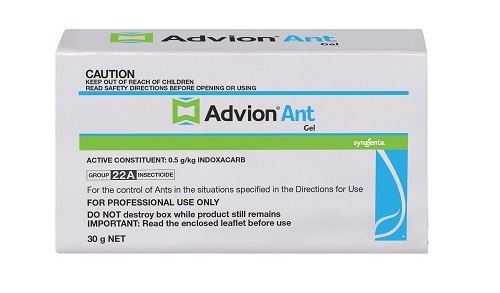 ADVION Ant Gel delivers superior control against a wide range of ants, including protein feeders andall key sugar-feeders. Use it to eradicate the entire colony and reduce those frustrating call backs – all through the convenience of a gel formulation. How does AVDION eradicate the entire ant colony? Ants are social insects that share responsibility for gathering food, caring for young and feeding the other colony members. ADVION exploits this behaviour by attracting foraging ants, who consume the bait and its active ingredient, indoxacarb. When ingested, enzymes convert indoxacarb into its more potential bio-active form. Tests show foraging ants have time to return to the colony and share the active ingredient with the brood and the queen – impacting all ants at different life stages. Although most of the ant feeding activity occurs in the first 24-72 hours, ADVION remains palatable for an extended period. On top of using ADVION Ant Gel, a band spray with ARILON Insecticide is also recommended for outdoor jobs and areas where populations are very high.